Martin Luther King, Jr. was one of the pivotal leaders of the American civil rights movement. King was a Baptist minister, one of the few leadership roles available to black men at the time. He became a civil rights activist early in his career. He led the Montgomery Bus Boycott (1955–1956) and helped found the Southern Christian Leadership Conference (1957), serving as its first president. His efforts led to the 1963 March on Washington, where King delivered his “I Have a Dream” speech. Here he raised public consciousness of the civil rights movement and established himself as one of the greatest orators in U.S. history. 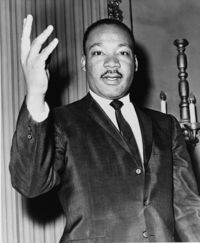 In 1964, King became the youngest person to receive the Nobel Peace Prize for his efforts to end segregation and racial Martin Luther King, Jr. was one of the pivotal leaders of the American civil rights movement. King was a Baptist minister, one of the few leadership roles available to black men at the time. He became a civil rights activist early in his career. He led the Montgomery Bus Boycott (1955–1956) and helped found the Southern Christian Leadership Conference (1957), serving as its first president. His efforts led to the 1963 March on Washington, where King delivered his “I Have a Dream” speech. Here he raised public consciousness of the civil rights movement and established himself as one of the greatest orators in U.S. history. In 1964, King became the youngest person to receive the Nobel Peace Prize for his efforts to end segregation and racial discrimination through civil disobedience and other non-violent means. Series by Martin Luther King Jr.
GdL Saggistica Marzo-Aprile 2018. Per scegliere clicca sul rettangolo del saggio che vuoi leggere. I have a dream. L'autobiografia del profeta dell'uguaglianza di Martin Luther King Jr.